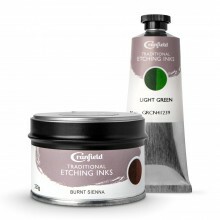 Etching ink is a slow drying, thick consistency ink. In etching it is applied to the etched plate and then rubbed away slowly, taking ink away from the raised surfaces and pushing the ink into the etched lines. When the plate is run through the press the ink is deposited on to the paper.